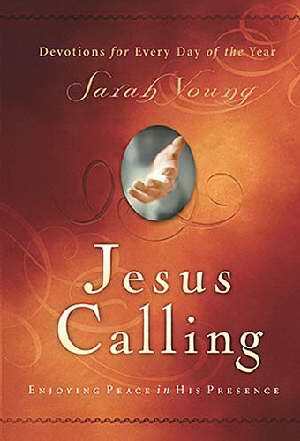 I have made it no secret that Jesus Calling (Sarah Young) is my FAVORITE devotion ever! Dana & I discovered it on our couple's retreat to the cottage back in 2010. Being the precious friend that she is, she got Jon & I a copy for Christmas that year, and since then we have gotten one for lots of our friends and family members. I still read it every day and cherish it. It is truly a beautiful way to start my mornings, so if you’re looking for a new devotional, I definitely recommend this one. "Relax and let Me lead you through this day. I have everything under control: My control. You tend to peer anxiously into the day that is before you, trying to figure out what to do, when. Meanwhile, the phone or the doorbell rings, and you have to reshuffle your plans. All the planning ties you up in knots and distracts you from Me. Attentiveness to me is not only for your quiet time, but for ALL... your time. As you look to Me, I show you what to do now and next. Vast quantities of time and energy are wasted in excessive planning. When you let ME direct your steps, you are set free to enjoy Me and to find what I have prepared for you this day." I just found your fun blog!!! I have a question for ya but can't find you email address?! I have been reading your blog for a while but never say anything. Your blog is very encouraging and I love reading about you walk with God. After reading your post today I had to post a comment because I love this devotional! A good family friend told me I had to get it last month when my dad passed away and I am so glad I bought it. I love how it is as if God is speaking directly to you. Thanks for being a good example of a Godly woman. I really look forward to your encouraging posts. I have been reading your blog for some time now and love how encouraging your posts are. After reading todays post I just had to comment as I absolutely love this devotional. It has really helped me get through this past month as my dad just passed away. A good family friend of my parents recommended this book right after my dad passed and I am so glad I went and bought it. I love how it is written as if God is speaking directly to you. It is a great devotional that has helped me grow closer to God and get me back into going to church (as that was one of my dad's dying wishes for my mom and self). Thanks for writing such great uplifting posts. Wow! Your post today was exactly what u needed. I have so much going in with life and work and struggling to stop thinking and planning everything. It really helped and for that I thank you! I needed this today! Love you girl! I love everything you post! Most your topics (aside from the health and fitness.. haha) apply to my life and are helping me a great deal. But I was wondering what denomination you are. And what church you attend. From your wedding pictures it looks like we are from the same area!